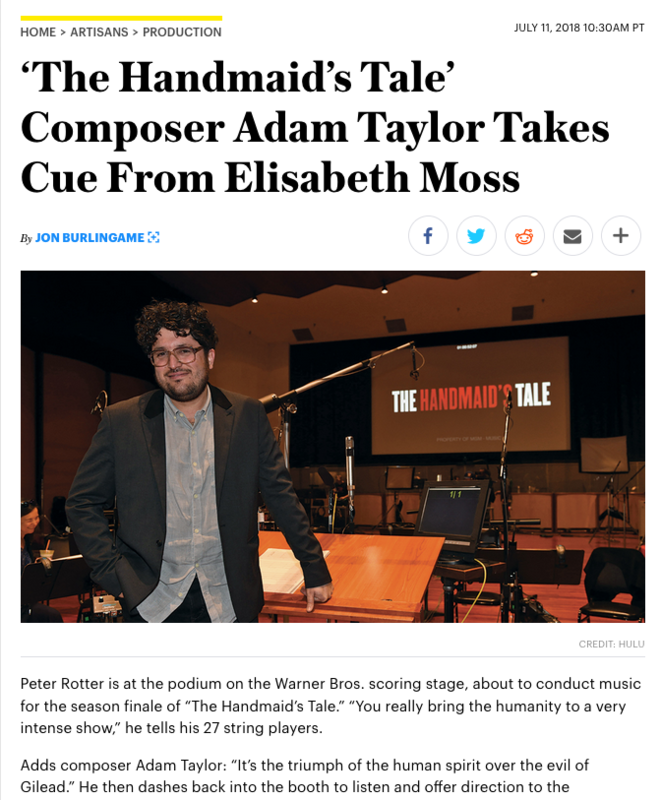 Adam Taylor has just finished scoring the second season of the acclaimed, Emmy-winning Hulu series The Handmaid’s Tale. I got to attend the final recording session for the season and was sworn to secrecy about the details of those last two episodes — but it was worth it to watch a 27-member string ensemble enhance the drama with their exquisite playing on the Warner Bros. recording stage. What was even more fascinating was interviewing both Taylor and, via email, star-producer Elisabeth Moss about the importance of music in the series. The story ran July 11 in Variety. 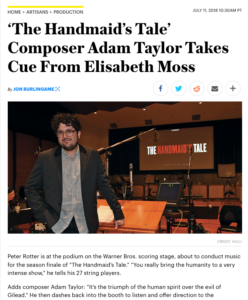 This entry was posted in Composers, Interviews, Television Music and tagged Adam Taylor, Elisabeth Moss, music in Handmaid's Tale, The Handmaid's Tale, Variety on July 11, 2018 by Jon Burlingame. On Thursday I was pleased to be part of the advance showing of the season-ending cliffhanger of Hulu’s acclaimed The Handmaid’s Tale. 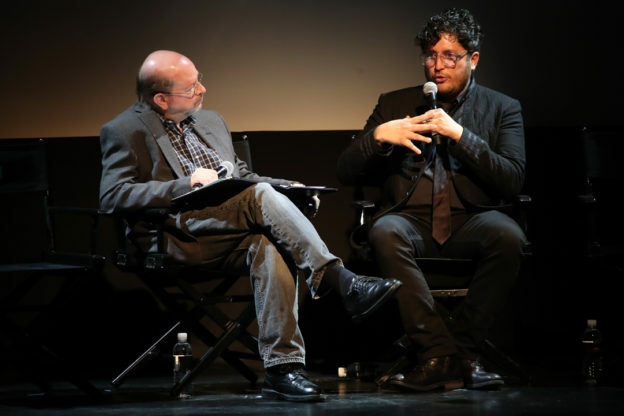 It was a special screening that included a live-to-picture performance of the score by Adam Taylor (22 musicians from the Hollywood Studio Symphony conducted by Peter Rotter). Afterwards, I conducted a Q&A with the composer about his unusual musical choices and dark soundscape for the chilling dystopian drama. Here is an overview of the event and my interview with Taylor. The Montalban Theatre was packed with nearly 1,000 Handmaid’s Tale fans; star-producer Elisabeth Moss and several of her co-stars were also on hand. This entry was posted in and tagged Adam Taylor, Elisabeth Moss, Hollywood Studio Symphony, Hulu, Peter Rotter, The Handmaid's Tale on June 9, 2017 by Jon Burlingame.